"Debt Analyzer ... took a great deal of pressure and stress out of our lives, and the future looks so much brighter ... Thank You." Do you feel hopelessly in debt? If so, then you are not alone. In the United States, consumer debt (which does not include mortgage debt) currently exceeds 2.4 Trillion Dollars, double what it was just 10 years ago. This equates to roughly $8,300 of consumer debt for every person in the US, infant to elderly. What can you do? Use the Debt Analyzer to understand your debt situation and create a plan to be debt free. Generate your own plan! 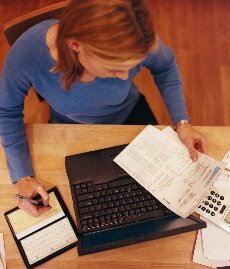 Create a professional debt reduction plan applying the same techniques used by banks and credit counselors. And, do it in the comfort and privacy of your own home or office, thanks to the Debt Analyzer. Save money! You save hundreds or thousands of dollars by following your debt plan. Design plans for others. Produce an unlimited number of plans and reports for friends, family or clients. Stop debt in its tracks! Download a copy now to start on the path to debt freedom. Debt Analyzer comes with a 30-day evaluation period. Purchase for only $29.95. View the Data Sheet (448 KB PDF). I love Debt Analyzer! Our family is on the road to financial independence. Read what customers say about Debt Analyzer. Windows 8, 7, Vista, XP, 2000, Me or 98. Windows Server 2012, 2008, 2003 or 2000.